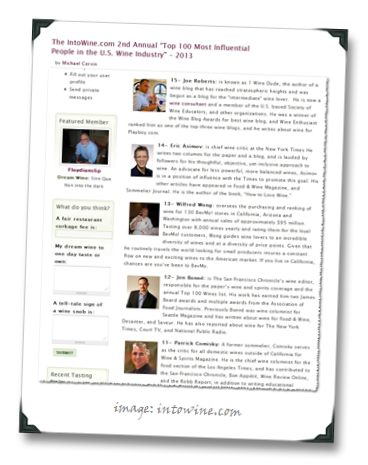 Last year, Michael Cervin (with whom I later toured the wine scene in Crete) from IntoWine.com stirred up a minor sh*tstorm when he published the inaugural version of his list of the Top 100 Most Influential People in the U.S. Wine Industry. We love lists, and we hate them. Hence the ensuing sh*storm: why was so-and-so left off? how could they place what’s-his-name so high up on the list? are these guys just attention-grabbing?… etc. My takeaway last year was that the list was “good for a pulse check, probably bad for anything more substantial than that.” I’m pretty much of the same mindset regarding the recently-published 2013 version of the list. Just as was the case last year, there are (in my eyes, anyway) some glaring omissions, as well as some odd placements in the 80s and 90s of folks who probably should be in the 20s or 30s (page through the list on the IntoWine.com website, and you will immediately see what I’m talking about). Some people will be happy to see people like me ranked highly on this list, while it will drive some others bonkers, but there’s nothing much I can do about either scenario, except drink some wine (and, as you know, I was gonna go ahead and do that anyway!). At the end of the day, I’m just really grateful to be doing what I’m doing. And while you’re reading this, I’ll be playing the role of Team USA at the 2013 Argentina Wine Awards in Mendoza, with probably little time to argue about the various positions on the list in between sipping and spitting a few hundred Malbecs (hence the break from the normal Thursday wine review – sorry, probably should’ve mentioned that earlier… whoops!). There has been a fairly robust discussion going on about the list over at Tom Wark’s blog (with Michael Cervin chiming in); the comments section there should give you a large Burgundy-style glass full of both measured thoughts and outright snark. To those who’ve supported me over the years here and have offered me congrats when mentions like these lists happen, you’ve got my heartfelt thanks (but you already know that! ); to those who are pissed off whenever my name gets mentioned publicly: sorry, but I’m not planning on going anywhere anytime soon, lists or no lists (if it’s any consolation, I can offer you a crap-ton of suggestions if you need a glass of wine to cope :-). 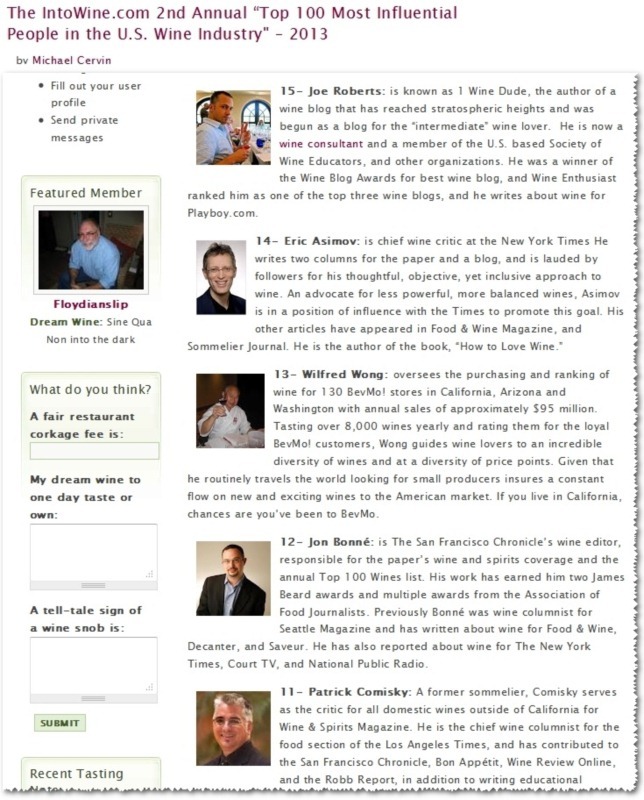 1) At this point, while people in the U.S. wine biz could be forgiven for not expecting an on-line influencer to be within the top 20 names of such a list (I’m still shocked, frankly), if they are also surprised to have online influencers on the list altogether then they’ve just not been paying attention to their business over the last five years (and might have gotten their heads lodged firmly into a place that would require a belly-button window to provide visual input from the outside world). Having said that, the big question I have walking away from this year’s list is why aren’t there **more** on-line media peeps on it? It suggests that the wine biz doesn’t give enough of its attention to on-line media (and guess what – it doesn’t!). 3) I feel privileged in that of the Top 100 names of U.S. wine biz influencers, I personally know and/or have hung out with and/or count as friends and/or have interviewed over a third of them. And a good many of that third-and-a-bit are just fantastic f*cking people: generous, knowledgeable, fun, friendly, honest and insightful. Yeah, there are a few bad apples, but if there weren’t then it would have to be a list of robots, not vino-imbibing humans. All in all, that’s a sign, I think, of what a true blessing it is just to be in this business (and even more of a blessing to be counted among the ranks of people like that). just one persons opinion I guess. I was always skeptical of critics as a wine buyer; but being on the other side, you get a new appreciation of how small wineries benefit from good reviews – shipping out a couple extra pallets, picking up a new out-of-state distributor, or even just a congratulations from a friend. Its really forced me to re-think my opinion about wine scores. Anyhow, the winery where I work has been reviewed a few times lately, including a great piece you wrote about our Bon Sauvage tasting "authentic". That was one of my favorite reviews, and not just because you talked about me :-) I like that you "got" our wines and explained what we were doing. Dr Vino wrote about a friend of mine, and he picked up distributors in two new states. So the influence of bloggers is real. But Wine Spectator did an Oregon issue for February, and the effects are resonating across the valley, with all sorts of wineries picking up new distributors, and distributors calling from all over the country for more wine. Thanks, Gabe. It would be tough to deny their influence in terms of buying power, I think, with distributors and importers, etc. We actually have gotten a little interest from Pennsylvania. The real problem is that they only order one wine at a time, and when it sells out it sells out. In other states, we have distributors that order wines on a regular basis. We have great distribution in New York and Mass, but until the law changes, PA will be a "get it while you can" state. Fortunately, our Spectator review did move the needle in PA, and we recently sent them a couple samples. As for Memorial Day weekend, that is actually a great weekend to go tasting in the Willamette Valley. Almost every winery has an event that weekend, including ours. Our newest cellar worker is a former professional chef, and if the weather is nice we will give horse tours of the vineyard. I hope you can make it out, it would be fun to meet you. If you have any questions, you can email me : gabe at illahevineyards dot com. thanks Gabe I'll definitely be in touch if we get our trip organized and are able to get down to Illahe. Paul Draper, Terry Thiese, Eric Solomon, and Alice Feiring are all infinitely more important than you, my man.